The history and future of the universe on one page. Copyright © 2013-2018 by Nicholas Jones. The creation account on page 1, Genesis 1, not only describes the physical creation preceding mankind but prophetically describes the 7, even 8, millennia following Adam. ...6 down, 1 to go! Mapping days 1-4 ... The Old Testament. Mapping days 5-6 ... The New Testament. Mapping days 7-8 ... The Future. 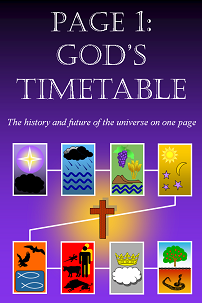 God’s timetable starts with the creation of Adam after God rested on day 7, exactly as written. Intriguing issues are simply explained and the heart of the Father for His son is revealed. The page 1 creation account is viewed through God’s eternal attributes. The roles of the Father and the Son in creation are revealed along with God’s time-scale. We even get a peek at how the material universe appeared. These appendices support and extend the three themes of this book. They contain more exciting insights, not to be skipped. B2. Was day-6 man hairy? C1. So, where were the heavens created? These supplements follow-up issues raised specifically in this book and go into more detail than the book can take things. Some refer to other internet sources and cover on-going discussions and support. Many other issues not directly related to this book are covered in other parts of this web-site. These can be accessed from the Cover page. So, do you want to Get a copy?